Bangkok can be a hot, hectic, and overwhelming city. 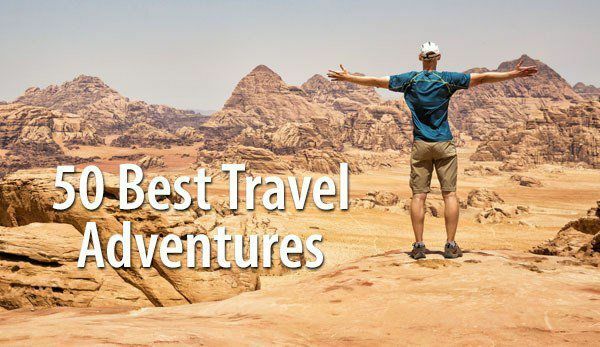 It can also be a delight to explore, with golden temples, floating markets, luxurious shopping malls, and some of the best street food in Asia. 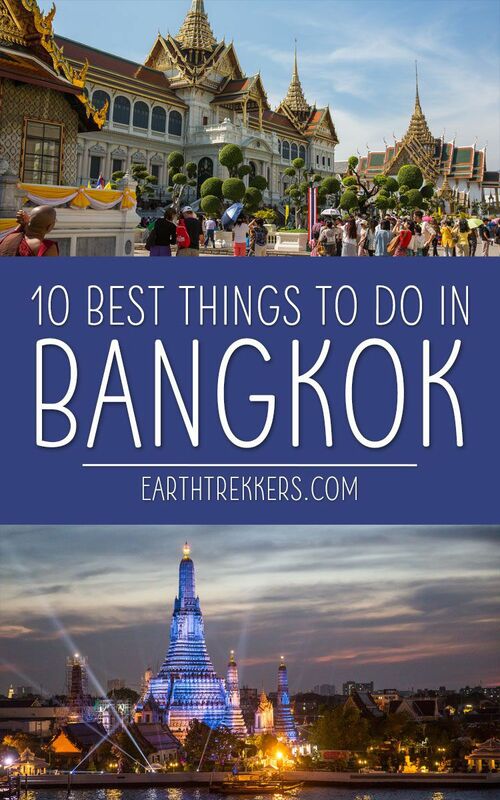 Here are the best things to do in Bangkok if this is your first (or second!) time in the city. 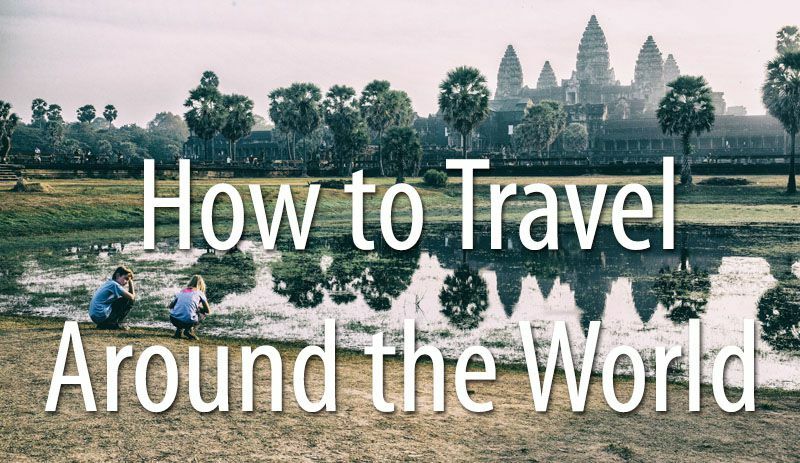 At the end of this post, we offer travel tips to help make your first time in Bangkok an awesome experience. 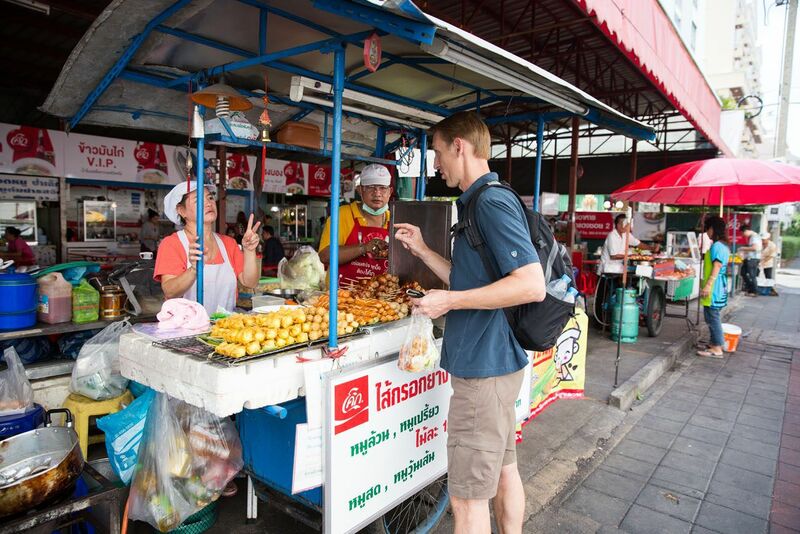 Without a doubt, our favorite thing to do in Bangkok is to EAT. 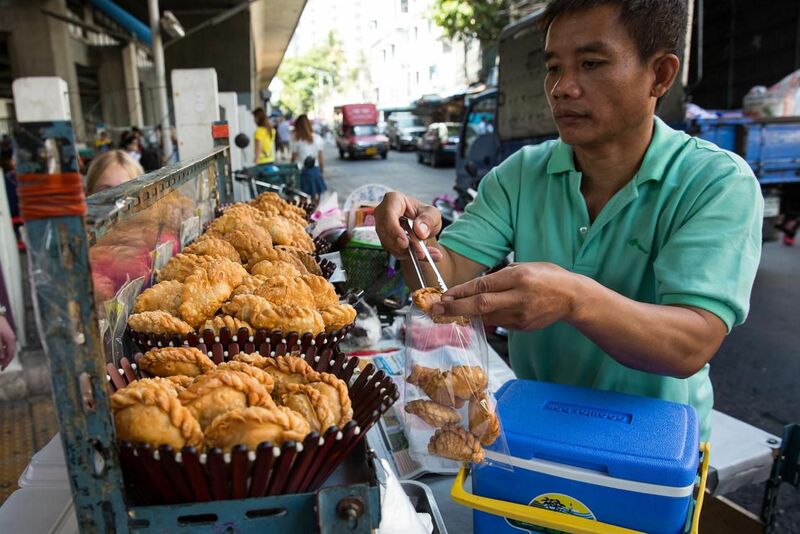 Where do you get the best food in Bangkok? 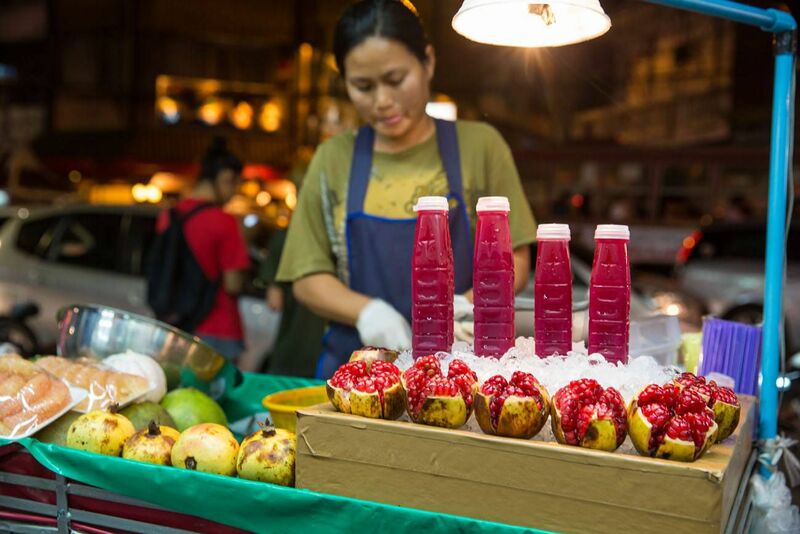 It’s up to you to find your “best place,” but the options for a great meal are almost endless in Bangkok. 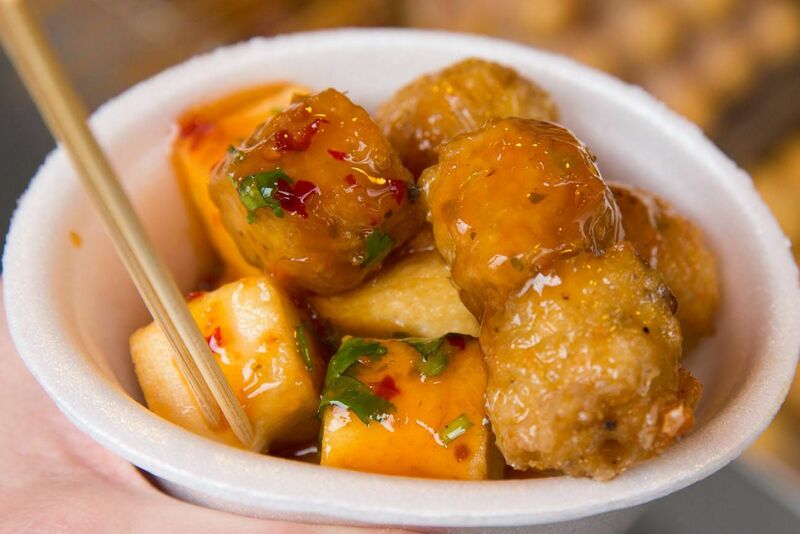 The street food is wonderfully cheap ($1 to $2 per dish) and can be found throughout the city. Actually, it’s almost impossible to walk down a street in the center of town without bumping into a food stall. We stayed in the Silom district of Bangkok so we didn’t have to go far to try the street food at Silom Soi 20. 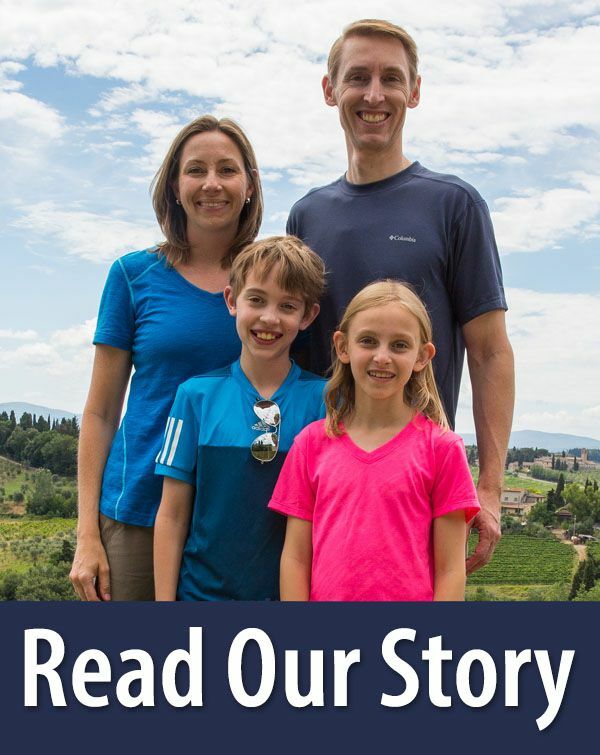 Our family of four could eat lunch for $6! And it was all soooooo good. Just writing this makes me want to travel back to Bangkok for the food. Chinatown (also called Yaowarat) also makes a great spot to try street food in Bangkok. It can get crowded and finding a table at some outdoor restaurants can be tricky, so get here early in the evening (if you are here for dinner) or just be prepared to wait for a table. Definitely try the fresh pomegranate juice! 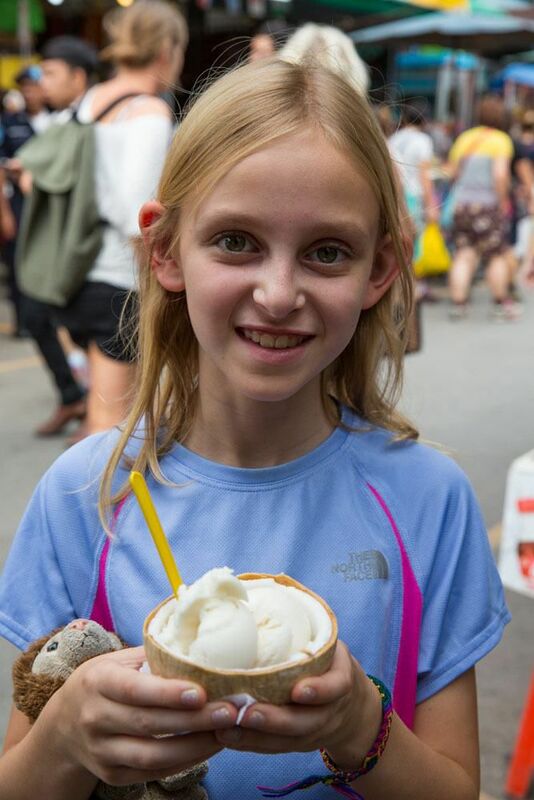 Finally, if trying random foods on the street sounds a bit crazy to you, how about a food tour? For a colorful, exotic experience, visit a floating market. 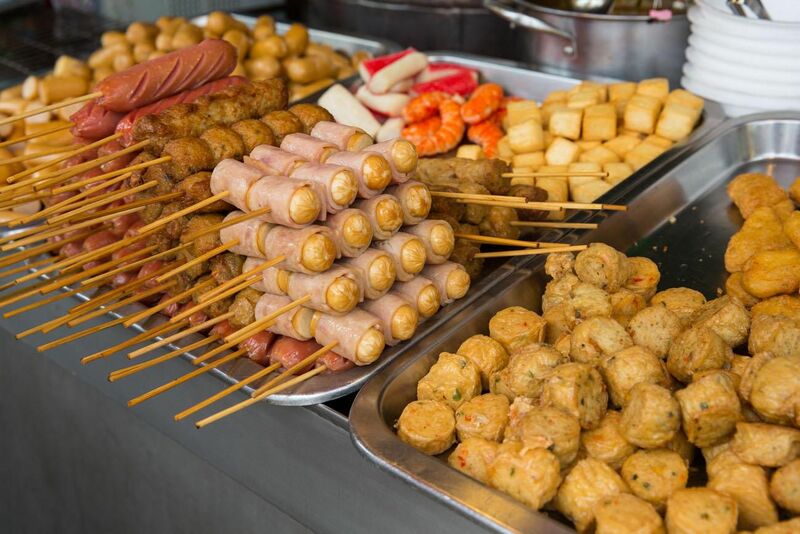 There are a bunch to try in Bangkok and some are more popular than others. 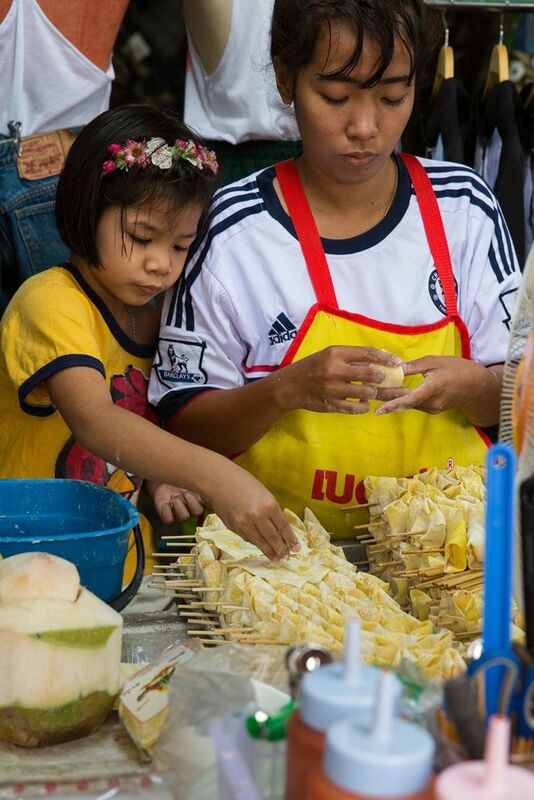 In downtown Bangkok, Khlong Lad Mayom and Taling Chan are the most popular. You can get here by public transportation. These markets are only held on Saturday and Sunday mornings. For the iconic floating market experience, travel 100 km from Bangkok to Damnoen Saduak. This is where you will find a river full of wooden boats and people selling colorful flowers and foods. 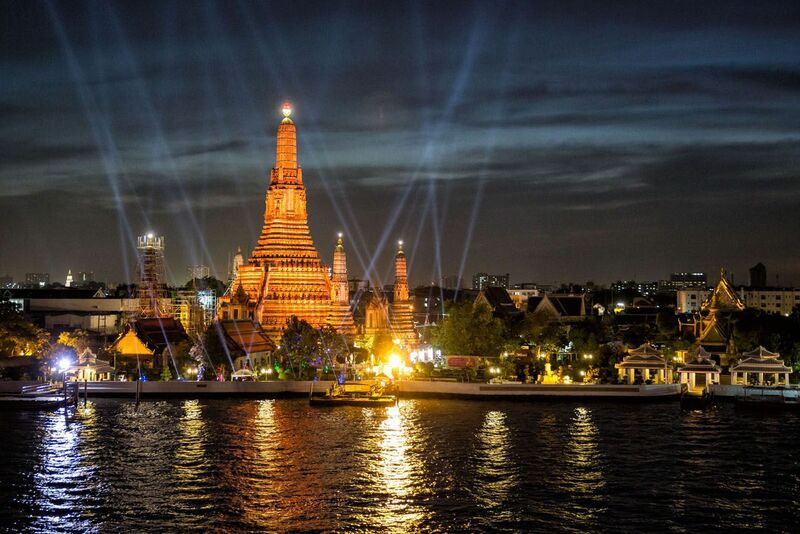 A great way to end the day is to grab a table at a rooftop bar and watch the sunset over Wat Arun. We had drinks (and took these photos) at the Eagles Nest Bar but you can also have dinner at The Deck Restaurant at Arun Residence. Like the floating markets and street food in Bangkok, there is also a never-ending number of temples to visit. 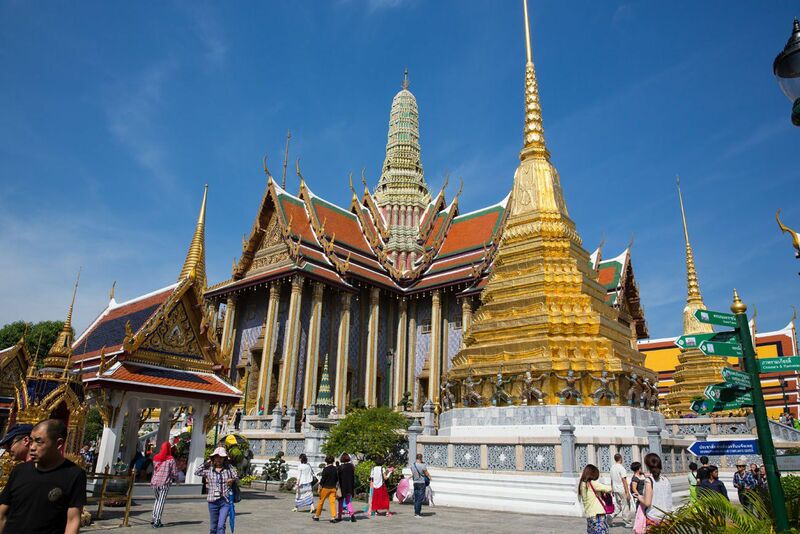 The Grand Palace is an enormous complex of temples and royal residences. 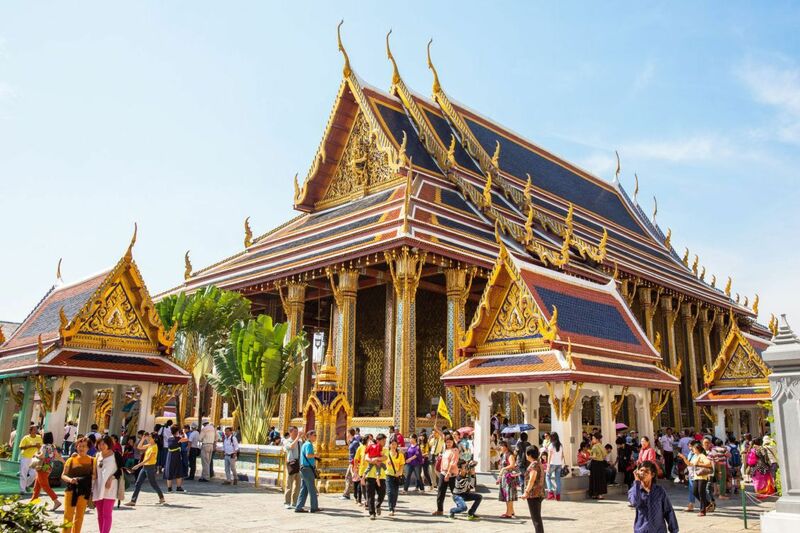 The Temple of the Emerald Buddha (Wat Phra Kaew) is the highlight of a visit here, but the ornately decorated buildings are also something to see. Expect to share this visit with a lot of people. If you want to see an enormous, golden reclining Buddha, walk a few blocks to Wat Pho. You won’t be disappointed. If you’re not “templed out” yet, a few more to visit include Wat Saket, Wat Mahatat, and Wat Suthat. 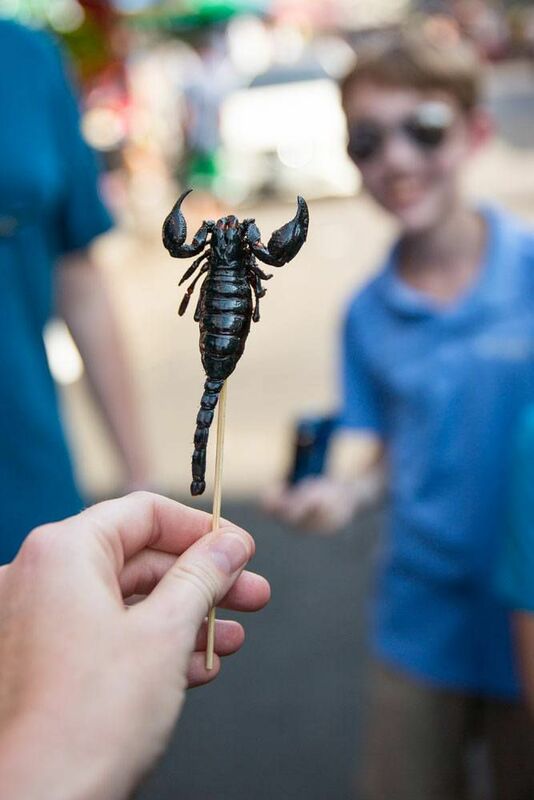 Would you eat a scorpion? Did you know that’s even a thing you can do? Regardless if you would dine on insects, Khao San Road is worth a quick visit. 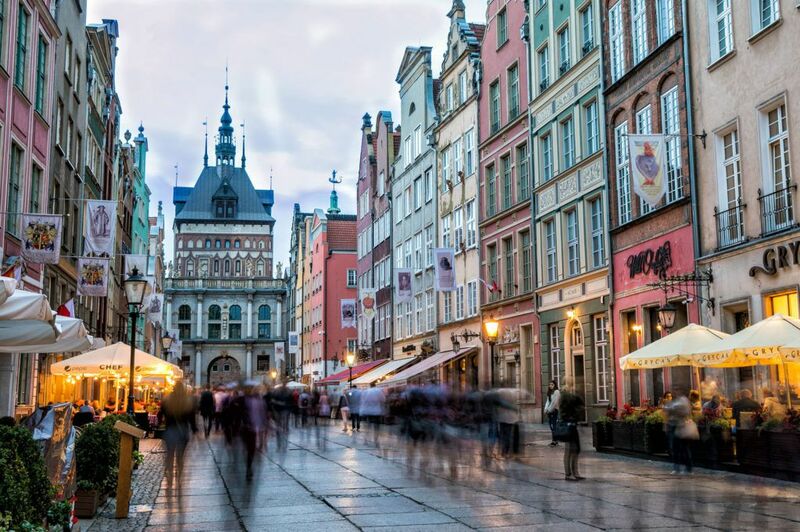 This short street is home to restaurants, bars, and backpacker hostels. 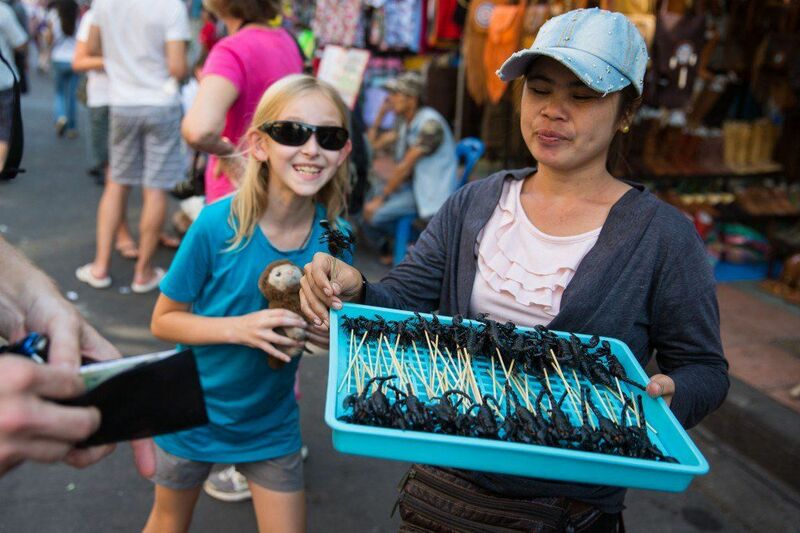 And yes, it’s also home to one of Bangkok’s most adventurous street foods, fried scorpions. If you have enough drinks at the bars on Khao San Road these scorpions become a little more enticing. From someone who has tried it…they’re really not that bad! 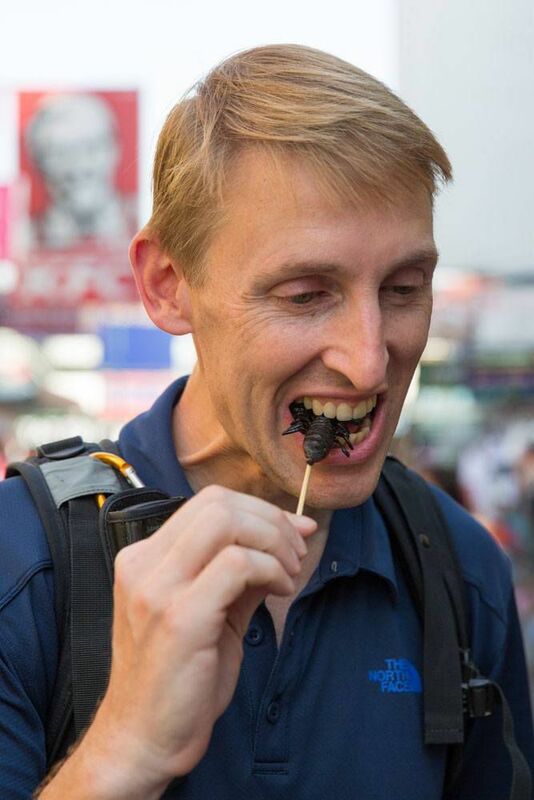 Scorpions are crunchy and no, they don’t taste like chicken, they taste more like bacon or beef jerky. Give it a try and then comment below and let us know how it went! Jim Thompson was an American merchant and architect who helped revitalize the Thai silk industry in the 20th century. In the 1950’s, he constructed his Thai-style home in Bangkok and filled it with antiquities he collected from around the world. In 1967, while in Malaysia, Jim Thompson mysteriously disappeared. The Jim Thompson House is now one of Bangkok’s most popular tourist attractions. The Chatuchak Market is amazing. Every weekend, thousands of shops sprawling across 27 acres sell food, clothing, souvenirs, and home goods. Don’t just expect cheap clothing and gaudy souvenirs…you can buy beautiful jewelry, high quality hand-crafted goods, and fashionable clothing. Be prepared to barter and to have a good time. Yes, you are reading this correctly. I am recommending a visit to a shopping mall. Shopping malls in Bangkok are ultra-modern buildings filled with food courts and high-end shops. They are also a great place to escape the heat and crowds of the Bangkok city streets. 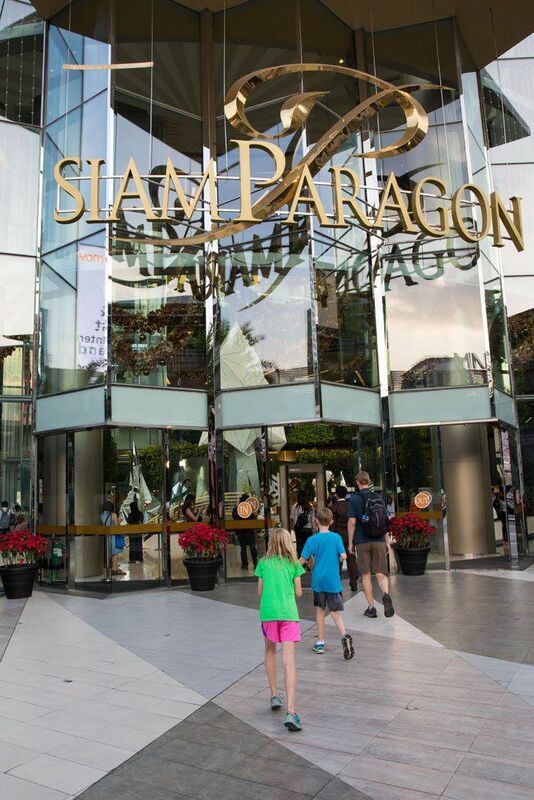 For an over-the-top movie theater experience, go window shopping at Siam Paragon Mall and then watch a movie at the Paragon Cineplex. At the Paragon Cineplex, you can lounge in reclining seats or theater-styled beds, eat gourmet popcorn or have a full meal, and even get a foot massage. They also offer 4D movie experiences and the largest movie screen in Thailand. Take a look at all of the different theater experiences and get a listing of showtimes on the Paragon Cineplex website. For less than $10, you can hire a Thai masseuse to bend your body in directions you never knew it could go. Just make sure you ask your masseuse to go easy on you the first time…this is probably not like any massage you have ever had. I had my first Thai massage in Bangkok. This massage was not peaceful or relaxing; it was a wrestling match. For one hour my little lady bent me in all different ways, stretching my muscles all while doing deep tissue massage. She started with my feet, worked up my legs, then to my arms, finishing with my back. At times she was pressing so hard into my muscles I was trying to not make noise because of the pain. It felt like this tiny lady was going to rip me to pieces. I never asked my masseuse to go easy on me but I should have. I ended up feeling sorer after the massage than before it, but even so, I’m really glad I had this experience. Lumphini Park is the largest park in Bangkok. 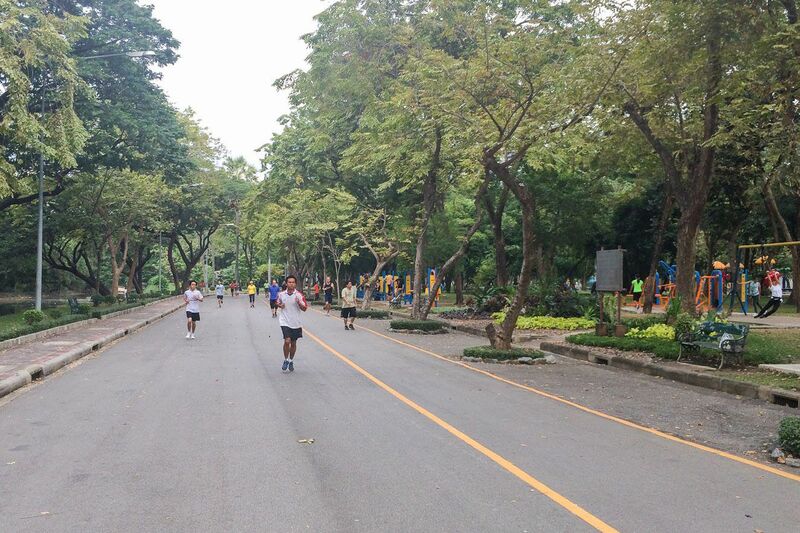 In the mornings, people come from all over the city to walk, jog, use the exercise equipment, and do Tai Chi. This is a great spot to take a break from the city streets and to see a calmer, more peaceful side of Bangkok. Bangkok is a gateway city to Southeast Asia. If you are flying into Thailand or one of the countries on mainland Southeast Asia, most likely you’ll be arriving in Bangkok. There are two main airports in Bangkok. Bangkok International Airport (BKK), also known as Suvarnabhumi Airport, is Bangkok’s largest airport. It sits 30 km east of Bangkok. To get into the city, you can take the Airport Link train (30 minutes, 45 baht), the public bus (60+ minutes and 60 baht), or a taxi (45 to 60 minutes and 250 to 400 baht). Don Mueang International Airport (DMK) is the older, smaller airport in Bangkok. It is located 23 km north of the city. To get into the city, you can take a taxi (30 minutes to 1 hour, roughly 200 baht) or bus #29 (30 minutes to one hour, 18 baht). Pro Travel Tip: Get a SIM Card before leaving the airport. The main cellular operators are True Move, AIS, and DTAC and pre-paid cards start at $10. These companies can be found in both airports. Bangkok has a wide range of public transportation options. The BTS Skytrain is fast and easy to use, sort of like a metro line that runs over the city streets. Bangkok also has a metro, called the MRT, which is cheap and easy to use. To get to the Grand Palace, take one of the express ferries on the Chao Phraya River. 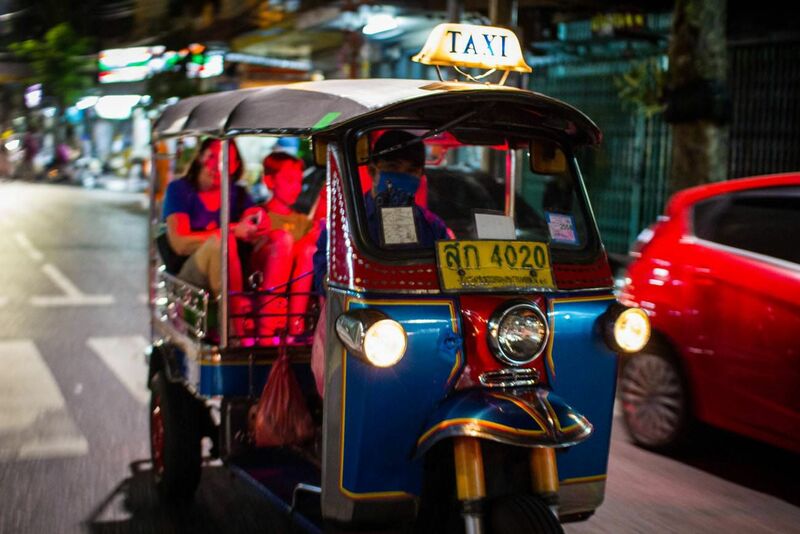 You can also use tuk tuks and taxis to get around, but you risk getting caught in the traffic jams that are so common in Bangkok. Finally, you can also get around by motorcycle taxi. To visit the main sites in Bangkok you only need two to three days. 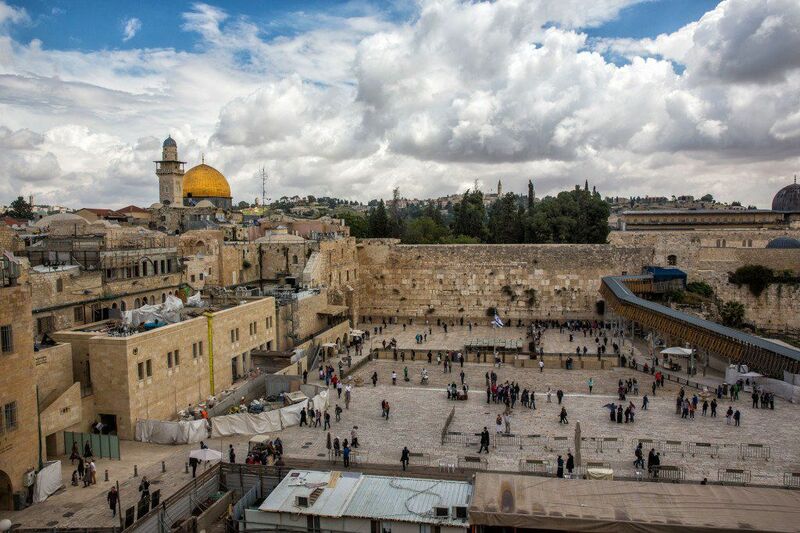 If you are arriving from the other side of the globe, it can be a little rough adjusting to the time change, so give yourself an extra day to get over any jet lag you may have. 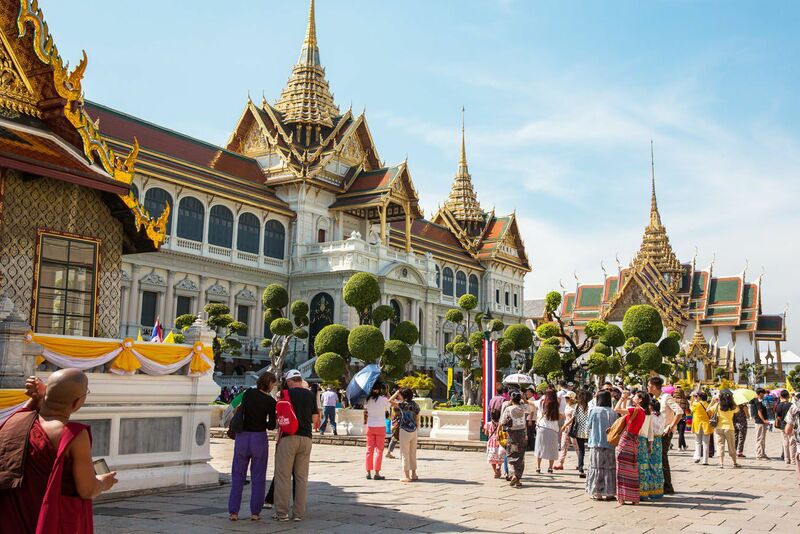 The best time to visit Bangkok is November through early March, when temperatures are coolest. 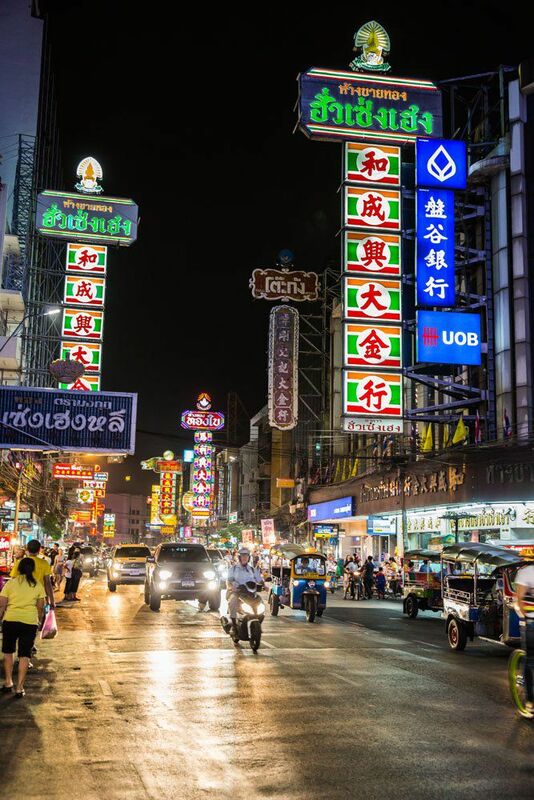 The days around Christmas and New Years are one of the busiest times to be in the city, as this is when many people flock to Thailand for their winter vacations. From May through October, expect hot, wet weather. 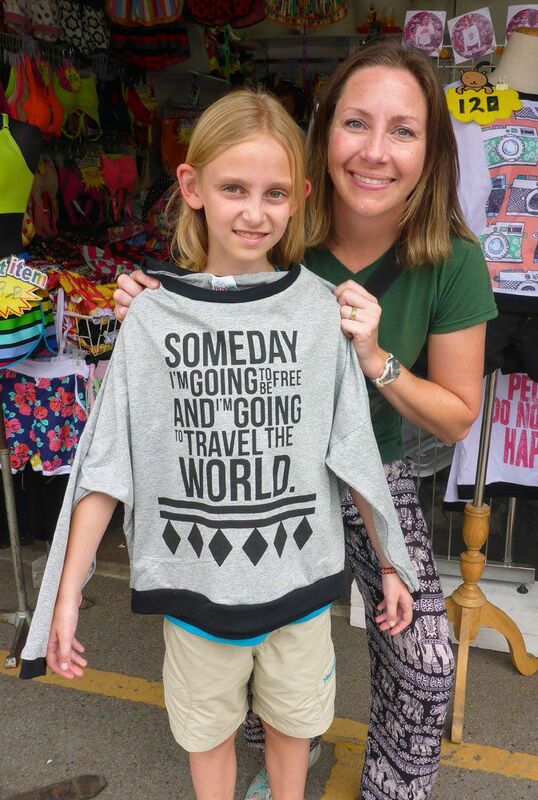 We visited Bangkok in December, during the week before Christmas. Daily temperatures were in the low 90’s and the temples and Chinatown were very crowded. 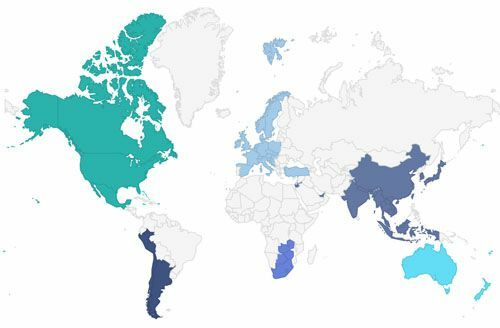 Citizens of 57 countries (USA, Canada, Australia, New Zealand, countries in the EU, Japan, Israel, etc.) 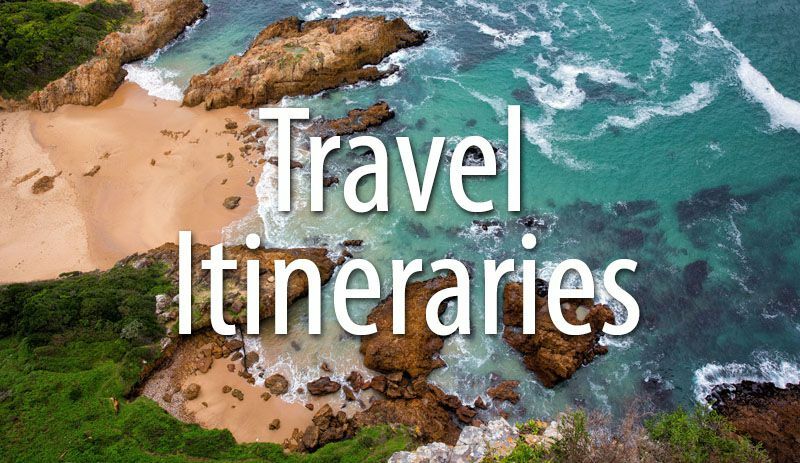 who plan to stay in Thailand for 30 days or less do not need a visa. 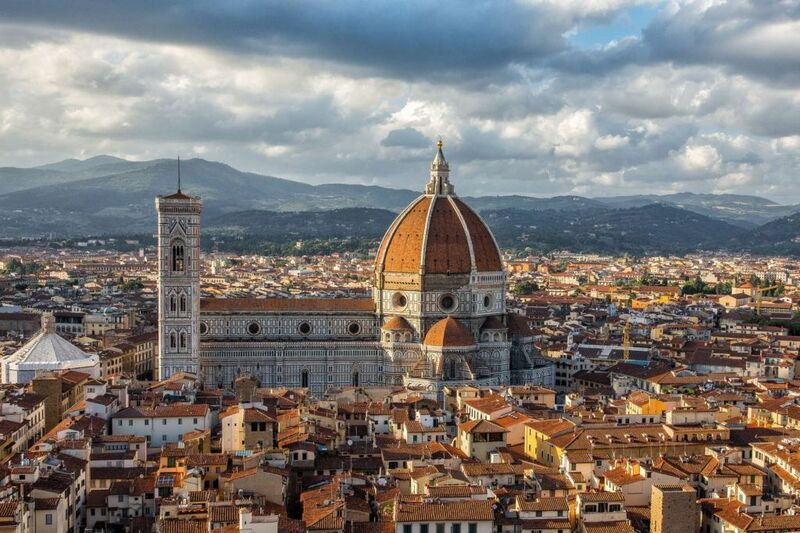 Learn more about the visa process here. 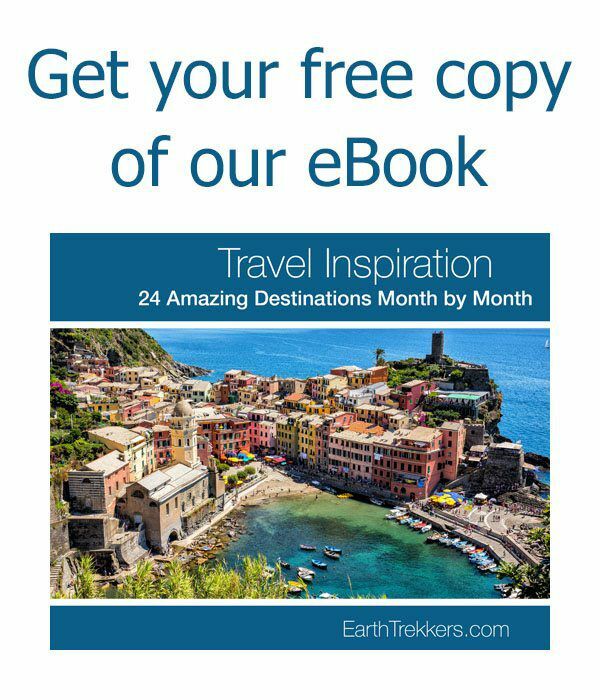 Are you traveling to Bangkok and Thailand soon? If you have any questions, leave them in the comment section below. 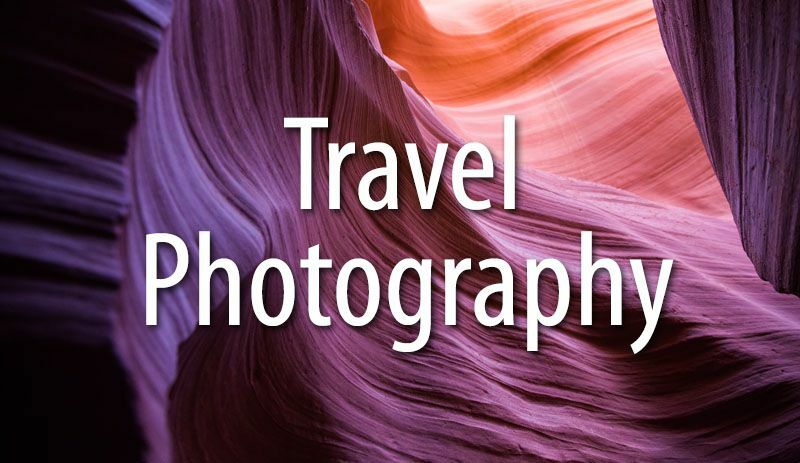 You have captured some of the best sights in Bangkok with awesome photos. Well done!